Box Dimensions (LxWxH) 6.2 x 3.6 x 2.15"
QBOX - Audio Line Tester/Test Tone Generator is rated 4.6 out of 5 by 28. Rated 4 out of 5 by CHARLES from QBOX - Audio Line Tester is EASY The QBOX does make the testing & verification of a variety of cable setups quite easy. Although any of the tests the QBOX can do can be replicated using simple DVM & a break-out box, none are as easy to use (in the field) as the QBOX. During events (recording or just setting up initially), sometimes things don't work as expected. To try to isolate and retest a veriety of equipment can be very time consuming. But since most problems are cable-oriented, the cables should be the first to tested. And the QBOX allows a fast testing cycle too. It looks like the QBOX will be very robust due to its construction and simplicity. Rated 3 out of 5 by Anonymous from A tool everyone needs. I use it to test almost everything. Whether used to generate signal or receive it this device is an essential tool for every live audio technician. The only issue with the device is its fragile switches that can break off in a backpack or dropped. . Keep it in a case or a work box drawer. Rated 5 out of 5 by Anonymous from QBOX THE INDUSTRY STANDARD If you work any audio job in TV or FOH this is an essential tool. I do not know a single pro that does not own one. It is crucial in trouble shooting all types of audio problems from phantom power to intercom anomalies. I've worked in TV audio on national shows for 26 years and have used this from the moment they became available. There is nothing better. Rated 5 out of 5 by Anonymous from Test gear needed We ordered the Qbox from Whirlwind for test equipment, the features of cable testing, tone generator and built-in speaker were the reasons for the purchase. I had intended its first use to be testing a press feed plate but another tech needed to test audio sends to pull down ceiling boxes for recording devices and was very pleased on the change from an AC powered speaker he originally planned on using to the much smaller battery powered unit and the size to a smaller more manageable sized unit for testing in several location on site decreasing the clients down time and techs time on site. The Qbox is tested and true piece of test gear throughout many industries and I don't think I would change anything. I definitely recommend this to anyone with audio in their profession. 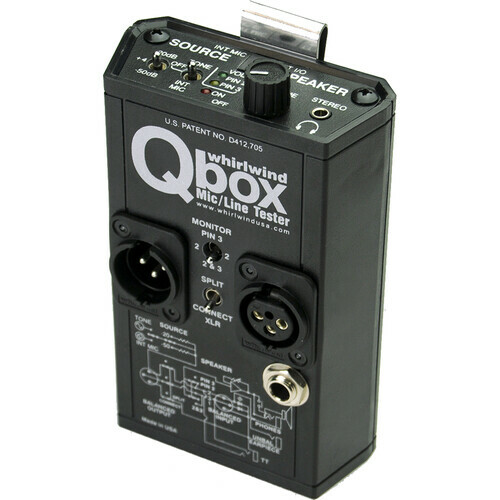 Rated 5 out of 5 by Jeff Sound Guy from Expensive but so useful If you do live sound reinforcement, you NEED a QBox. I have another tester that's great for testing cables before I run them but if you already have cables ran and something's not working, this is perfect for quickly troubleshooting and finding the problem. Great for identifying the cable you're looking for if you forgot to mark your ends, and quick line checks. Cool too that it can double as a clearcom in a pinch. Tone generator, built-in mic, excellent. Rated 4 out of 5 by CD from Great bit of kit, but......... Use this all the time to check, cables/lines/circuits. Absolutley invaluable to anyone on the front line however the on-off switch on mine no longer functions properly. The slightest tap switches the unit on and it is hit and miss whether it ever switches off. I now have to keep the battery disconnected and only connect it when I actually want to use the unit. Which is a shame. Better build would have got it five stars. Rated 4 out of 5 by Steve from Updated with TT connectivity The industry standard for diagnosing analog audio circuits in the field under harsh conditions.I spend a lot of time in TV trucks and I needed this tool.I used it the very first day after I got it while I was doing a set up in an unfamiliar studio. The addition of the TT patch point (paralleled with the female XLR) was very welcome and provides even more flexibility. Rated 5 out of 5 by Thundersnow from Cable tester for the win! I would recommend this product to any audio professional that is looking for a way to complete line check in a speedy manner. The l.e.d.s on the top tell you if phantom power or intercom voltage is present and the tone generator can output a mic level signal too. I have used this product extensively and can only say I wish I had four of them! does whirlwind Qbox use for call transmission? This unit is rev2 or rev3? DOES ANYONE KNOW WHERE TO GET REPLACEMENT PARTS AND/OR PART NUMBERS FOR THE Q/BOX ? Unfortunately when I broke mine in the past I've had to buy a new one as all the parts inside are pretty well sealed up. I crushed the link toggle switches into the unit and my engineer was unable to take the circuitboard out because the front facing XLR's are attached to the face. All in all, not very user-friendly.